2014 Apple & Pear Crop is approaching quickly! Yakima, WA – Borton Fruit is gearing up for the quickly nearing 2014 Apple & Pear Season. 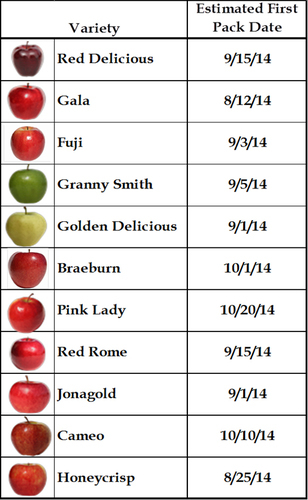 We are in the final packing stages for our Quality 2013 Apple Crop Varieties; Red Delicious, Fuji, Granny Smith and Golden Delicious, as well as working through the rest of our Pink Lady manifest. Cherry season is winding down as we will be receiving our last bins in through the weekend/first part of next week. Quality and sizing have remained superb through the entire season! The manifest is currently generating beautiful quality cherries, so don’t hesitate contacting your account representative with inquiries! 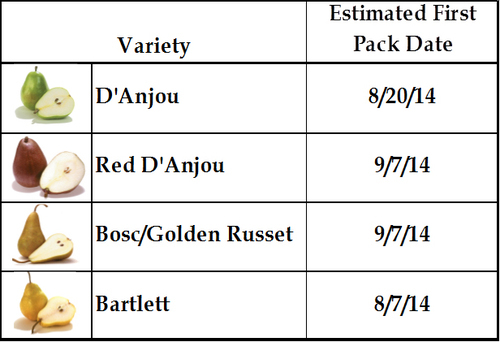 In an effort to help our customers in planning for the upcoming season, we’ve put together an estimated pack date schedule for all of our apple and pear varieties. In addition to the list below, we will have some Ginger Gold Apples coming off the trees within the first week of August. Following shortly after, will be New Crop Bartlett Pears, estimated to begin around August 7th, and our New Crop Gala’s beginning around August 12th. Borton is expecting to have an outstanding crop this year and we are excited to share that with our valued customers! If you need any information going into this new season, please email info@bortonfruit.com.